Celestial bodies – including the Moon or near-earth objects (NEOs) such as asteroids – are naturally forming objects found beyond Earth’s atmosphere. Many planets, moons and asteroids contain a rich diversity of inert physical substances such as metals, along with gases and water that could be used as energy sources and means to sustain human life as we venture deeper into space. Many of the metals found within the Moon and other celestial bodies are already scarce on Earth. One day, we may use them not only to construct equipment in space but transport them back to support terrestrial activities, employing on Earth the technologies developed to explore and mine resources in space. NEOs are close to Earth in astronomical terms. Nudged by the gravitational pull of nearby planets, they are within 1.3 Astronomical Units (1 AU = 150 million kilometers). NEOs take different forms. Comets, which are formed in the cold outer planetary system, are mostly frozen water embedded with dust particles. Rocky asteroids are formed closer to home, in the warmer inner solar system between the orbits of Mars and Jupiter, from the residue of the material that constituted Mars, Mercury, Venus and Earth itself. Asteroids show a large variety of material composition, such as carbon-rich (C-type), metallic (M-type) or mineral-rich silicate (S-type). 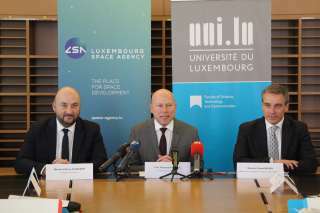 Around 15,000 near-earth asteroids of various sizes had been identified and listed by the end of 2016, according to the US National Aeronautics and Space Administration (NASA), and their number keeps growing. The Moon is gravitationally bound to the Earth and is roughly 400,000 km away. Since the 1960s, 12 people have set foot on the lunar surface and close to 400 kg of lunar rock and regolith have been brought back to the Earth. These samples helped us to realize the immense resource potential available on the Moon. Earth’s natural resources are already under pressure from the planet’s growing population, estimated to reach nearly 10 billion by 2050. Rising demand for resources will eventually push the economic balance in favor of harvesting resources from space to sustain our lives on Earth. But for now, the clearer and more immediate benefits from mining resources are for use in space. Both, the Moon and NEOs contain significant, highly concentrated quantities of metals such as iron, nickel, tungsten cobalt and Rare Earth Elements, while ammonia, nitrogen, hydrogen and other useful gases have been detected. Frozen water, billions of tons which exist at the lunar poles and on NEOs, could be among the most important assets as man ventures further into the unknown. These valuable materials can be applied to technologies used in space and to sustain life in space. Not long ago, space exploration was the preserve of national governments and international agencies with access to the necessary financial resources. Today, private investors and companies utilize lower-cost technologies and have at their disposal the financial resources to launch satellites to explore the opportunities for mining resources on NEOs or the Moon. In doing so, they increase the knowledge on these bodies and may also contribute to help defend Earth against asteroid impacts, preventing material damage and human casualties. Mining space resources may well come surprisingly quickly. Expeditions to near-Earth asteroids and to the Moon have already yielded remarkable discoveries. The European Space Agency’s Rosetta probe, which was launched in 2004, astounded the world with images and data sent back from its Philae module after landing on a comet in 2015. The first Japanese Hyabusa (“Peregrine Falcon”) probe brought some 1,500 grains of material back from the Itokawa asteroid in 2010. A second Japanese Aerospace Exploration Agency probe should reach the Ryugu asteroid in 2018. If all goes well, its samples will be back on Earth two years later. The Moon was visited several times by the United States, the former Soviet Union and most recently China. The samples returned by the various missions and the data gathered since then proves the mineral wealth of the lunar rocks and dust. Moreover, the recent orbital missions, such as NASA’s LCROSS and Lunar Reconnaissance Orbiter, and India’s Chandrayaan-1 mission further increased the attractiveness of the Moon by showing large deposits of water ice in several locations scattered throughout the lunar poles. Many future missions are planned, by both national space agencies and private commercial entities. These missions promise to further unveil the resource potential and help us better understand the extraction and processing methods required to utilize the resource in space or on Earth.